The best of 2018's browser games and free downloads. Year on year, it only gets harder to keep up with the avalanche of free games tumbling onto Steam, itch.io and Game Jolt every day. How about that surprise Undertale follow-up? Or the sublime madness of Muscle World? Even the best games tend to get buried after a few weeks, so here's our handy guide to the cream of 2018, from horror and adventure games, to strategies, RPGs and mind-melting experiments. These are our favourite free experiences of 2018. This might have been the best surprise of 2018—a bite-sized follow-up to Undertale, featuring improved game mechanics and a bunch of lovable new characters. Is it a sequel? A prequel? A spin-off to Undertale? It hardly matters in a game that gave the world Lancer: the most adorably pathetic villain ever to grace an RPG. As with its predecessor, Deltarune's best feature is its writing, in particular its characters, who will make you laugh, and then break your heart, in an emotional rollercoaster of a story that's no less affecting for its relatively compacted length. There are further chapters of Deltarune to come at some point in the future, hopefully with Lancer back in a starring role. One of the highlights of this year's Adventure Jam, Aye Fair Lady is a musical point and click where (almost) every line of dialogue is sung rather than spoken, and by a cast of oddballs and robots sporting thick Yorkshire accents. You'll recognise those accents, and some of the characters, if you've played the developer's Yorkshire Gubbins, but this spin-off's bonkers plot has nothing to do with that episodic series, so this is a great place for newcomers to jump in. It's Mandatory Singing Day in the small Northern town you call home, and it's up to you to put a stop to it, by solving a few simple puzzles and ultimately competing in a wonderfully OTT singing competition. Comedy is a hard thing to get right in games, but The Stairfall Institute makes it look easy. This is a very silly, very British, and very funny story that at times feels like an interactive Reeves and Mortimer sketch. Free from the pressures and expectations that come with commercial game development, free games are the perfect medium in which to explore new ideas, to experiment with the form. Creator Ian MacLarty is behind a lot of this experimentation, and his most compelling experience this year is one that takes place in an infinite forest. Forests are for Trees gives you an (initially compact) forest to walk around in, with a garish colour scheme that reminds of a Smash Hits annual circa 1986. It's only when you approach a tree that you realise just what's going on: every one is a portal to a parallel dimension, a window onto another forest. It's strange enough being able to see into another reality in real time, but when you step inside a tree you find yourself seamlessly transported there: to a differently coloured forest home to yet more portal trees. You could go on like that forever, exploring a multiverse of multicoloured worlds. Mindustry is a tower defence game with a much bigger focus on base-building than is the norm. When you're not placing turrets, or roving around the landscape shooting at enemies directly, you'll be linking conveyor belts, building drills and pumps, and generally exploiting the natural environment to protect your home from ever bigger and badder threats. There's a lot to it, including a level editor, and LAN and online multiplayer. You might know creator 98demake for his mockup 'demake' videos, which recreate modern-day games including BioShock and Dark Souls, but in the style of early PlayStation titles. He's done the same for VHS found footage films with the stark September 1999: a first-person horror that lasts for exactly five minutes and 30 seconds. However, in such a short time it manages to make a big impression. Whether it's due to the quality of the 3D models, or the authentic VHS filter, or both, this looks convincingly like actual videotape footage, making the horrible noises and disturbing scenery in the game all the more unsettling. There are no clear answers in September 1999, but there are suggestive glimpses of a particularly grisly situation: a body under a tarp, blood on the floor, police outside the front door. Are you an observer, a victim, or even the killer? It's unclear. That question will stick with you after those five minutes are over, as the footage abruptly comes to an end. Another excellent freebie from the talented Atelier Sento, which has created several eerie adventure games set in Japan. 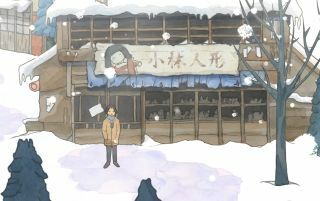 The Doll Shop transports you to a rural village that has been devastated by tragedy, and that's currently being blanketed in endless snow. It's a beautifully drawn, evocative setting that plays host to a creepy horror story involving an isolated doll maker, a childhood friend, and a missing girl. Longer than many similar freeware games, The Doll Shop takes the time to properly establish its setting and characters, before sticking the knife in at the very end. If you're up to date with your roguelikes, you'll doubtless be aware of Cogmind: a surprisingly gorgeous traditional roguelike with a modern, mouse-based interface, and some of the most atmospheric sound design around. Polybot-7, from its creator Kyratzi, boils Cogmind down to a (relatively) simple dungeon crawl focused primarily on combat. Oh, and hoovering up piles of loot from the dungeon floor. As with its progenitor, Polybot-7 is a beautiful game, its simple tileset enhanced with swish visual effects and a suite of evocative sound effects. But it diverges from Cogmind in some interesting ways. You play as a cute little robot who can be expanded with strewn parts or components blasted off enemies—every battle is a chaotic whirlwind of flying robo-bits. Sometimes less is more (or at least more approachable), and in stripping away most of the intimidating scope of Cogmind, Kyratzi has created a wonderfully streamlined and accessible roguelike. We generally think of games as starting just after we click on an executable file, but there's a vast frontier of under-utilised space in the folder, or folders, surrounding it. It's a space that Nathalie Lawhead has taken full advantage of, by cramming the many nested folders of Cyberpet Graveyard with reams of notes, images, videos and gifs, each a vital clue in piecing together the game's fragmented story. There's no single executable here—in addition to those supplementary text and image files, there are a bunch of .exe files, each of which will summon a cartoony cyberpet onto your screen. These little critters take the form of tiny popup windows, which will dart around your screen like buzzing insects, evading your attempts to pet them, or to close them down. Some will even create additional popup windows, like the creature that hurls up bits of digital barf. Even when they're being annoying—perhaps especially when they're being annoying—these Trap Door-style creatures are so bizarre, so charming, and so full of energy that you can't help but feel they're alive. Octavi Navarro makes some of the best pixel art around at the moment, and has recently started giving it a home in his own 2D adventure games. The Librarian is his best yet: an economical point and click mostly set in a magical library. You're the librarian of the title, waking up one night to discover spooky goings-on in your place of work. Goings-on that necessitate some light puzzle-solving, and a surprise bit of combat. The game lasts twenty minutes or so, but those feel like twenty minutes taken from a classic LucasArts adventure (albeit one with no dialogue, and chunkier pixels). The artwork is gorgeous, the world is a treat to explore, and the handful of puzzles present are pretty engaging. I can't wait to see what Navarro will be making in a few years' time. Inspired by From Software's King Field series, Muscle World might be the strangest game released in 2018—but it never feels weird for the sake of it. Playing as a bald bodybuilder wearing a teeny pair of pants, you enter an intimidating underworld that you have to conquer in order to become the ultimate champion. If it sounds like a comedy game, it somehow isn't, boasting an ambient soundscape and overall moody atmosphere reminiscent of most of From Software's games. In fact, King's Field II was the major influence on Muscle World. In this otherworldly, dreamlike action RPG, you have to climb across the ceiling to reach scattered islands hanging in the endless gloom of a massive cavern. Managing your stamina meter adds an element of tension to your traversal, but the game swerves into full-on horror the moment you see a rival bodybuilder climbing menacingly your way. Experience a day in the life of another person in this extraordinary stop-motion game. Stop your alarm, brush your teeth, ride the subway, zone out at work, make something for tea, crawl into bed and read a book. Each brief scene takes place from a first-person perspective, in a small window, with differing button inputs giving you control over the woman's actions. Use the arrow keys to shave your legs, or the middle parts of your keyboard to button up your shirt. Now reply to that email by hammering your keyboard. Now hold Up to check the internet while you sit on the loo. 10 Mississippi isn't saying that this daily routine is bad, exactly, but it does create a discomfiting distancing effect with the use of its vast black borders, its on-screen hands representing your own, and the buttons that let you control the woman like you're piloting a machine. It's distancing, but at the same time it's also intimate, showing far more of the minute detail of daily life that tends to get glossed over, or abstracted, in other games. We play plenty of first-person games, but rarely are they as first-person as this one. Following the evolutionary line from the deskbound Papers, Please, Cashbags sticks you firmly behind a hotel reception desk. However it's a not a hotel in some grim, dystopic state, but one in a surreal world that reminds a little of Gregory Horror Show, and more recently of Rusty Lake. At a basic level, this is a game of spinning plates, as you attempt to deal with a steady stream of new arrivals while replying to emails and taking phone calls from existing guests. It's a work of frantic silliness, elevated by some excellent dialogue: by your weird, funny, sometimes even sad exchanges with the hotel's many unusual guests.